The Pinellas Trail is a 34 mile hiking/cycling track that runs between St Petersburg and Tarpon Springs. Free guides to the trail are available at any of the Chamber of Commerce visitor centres between the two destinations. The guides are great, picking out places of interest and giving easy to use maps and mileage charts. There are loads of places to stop/start, allow time to detour and explore a bit more. The trail is well marked. If you don’t want to do all 34 miles why not take the bus to your selected start point. Many buses have special bike carriers at the front so it couldn’t be easier. A couple of points specifically about cycling in Florida: you MUST wear a helmet if you are under 16 even if you are just a passenger, every cycle must have a brake or brakes that allow you to stop within 25 feet from a speed of 10 mph on dry, level, clean pavement. A cycle used between sunset and sunrise must have lights. You can’t carry passengers unless your bike is equipped for multiple riders!! Prior to the race you have to go to ESPN Wide World of Sports to register and collect your bib number, jersey and directions. It is always well organised and this year was no exception. You collected your bib number and official event guide first and then head over to the Expo to collect your bag, jersey and safety pins. There are numerous stands selling running items and also the official merchandise stand. As you head out there are talks etc that you can also join. So a 3.30am start this morning to drive to Epcot for the Inaugural Disney princess Enchanted 10k run. The race started at 5.30am and participants were released in one of five corrals according to their predicted mile time. Before the race begins there is a great build up with photographers, DJ, celebrities and of course the Fairy Godmother and fireworks to start the proceedings. Having done the Epcot 5k and the Half Marathon a few times, I thought I would try the 10k out as it was the inaugural event and because I love Epcot. It was billed by the Disney employees as going around all 11 countries of the world – but that is not the case. The course takes you through the Epcot parking lot out onto the surrounding road ways and then back down into Epcot. We entered the world showcase at about Germany and then headed round to just before the UK where we then diverted off into The Boardwalk. Today was 98% humidity and a bit misty while still being 21 degrees – a little different from the training environment in the UK in February! The view was great and it’s not often you get to see Epcot like that, however, I couldn’t help but be a little disappointed that we didn’t go round the whole world. You finish off coming back into Epcot from the Boardwalk and then go round a lot of the back route/roadways until you pop out near the globe run underneath it and then head back to the Finish line in the parking lot. Along the way there are lots of character opportunities, plenty of restrooms, medical tents, water stops and enthusiastic supporters – it is a lovely friendly event to take part in. 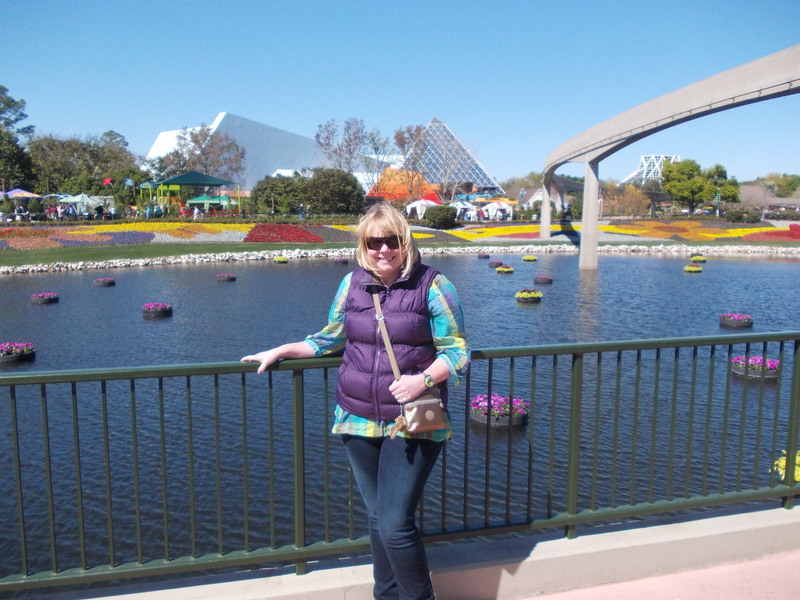 Overall, I would recommend it and I would say if you are even only slightly sporty and happen to be in Florida when one of the Disney runs are on then have a go – the Bling is fantastic! I think Disney has some fine tuning to do with the FastPass+ system yet – it will be interesting to see what happens. We also had a very poor experience at Cosmic Ray’s food outlet in Tomorrowland. We ordered from the Burger menu – nothing fancy just a veggie burger and a regular burger with no cheese. It took 20 mins to come – 20 mins. Other people who ordered and paid after us came and went. I asked to see the Manager and we were refunded for our meals, however, the experience was very poor and not what we would want or expect of Disney. The crowds started to reduce after the fireworks and we found that it was much less crowded watching the 2nd Electrical Light Parade than the first. A few years ago now, we were in a road traffic accident in Florida. We were waiting at a red traffic light when the truck coming up behind us was distracted and back ended our mid size SUV. The back crumpled and the back windscreen fell out. We had a friend and her 2 boys with us at the time – everyone was very shaken and it actually shoved us into the vehicle in front. It is the law to call the Florida Highway Patrol *FHP, which we did. Interestingly, the driver of the car in front of us decided to be on his way once the police were called despite his rear bumper being a little dented. The highway patrol arrived very quickly and were very efficient. The police officer used the loud hailer on the top of his police car to call me and the other driver to attend his patrol car. He was very pleased that I had both pieces of my driving licence – photo card and paper part plus the rental agreement in the car. He asked both drivers what had happened and then went back to his car to record the details and make a decision on what would happen next. In the meantime, we called Alamo and arranged for the car to be recovered and for an alternate vehicle to be delivered. Once the police officer was ready, he ‘hailed’ us back to his vehicle. He told me I had a nice top (I’m not even joking), told the other driver he was being citated and advised me I was free to go. He also advised everyone in my vehicle to attend the ER to get checked out. He provided me with a copy of his records, his decision and contact details. Call the FHP – it’s the law and you will need to for the car hire company. When they arrive be polite – they have a gun and a baton!! We had to wait a while for a replacement to be delivered, but once it was that was that – we didn’t have any problems when we dropped the car off or any time afterwards. We just spent the weekend in Sebring as my hubby was cycling the Bike Sebring 12 hours time trial event. We stayed at Chateau Elan as that was where registration was for the race – directly next to the International Speedway. The hotel is pleasant enough – probably not as good as the price suggests but obviously very convenient and great if you are a speedway lover. Our room overlooked the speedway and the outdoor pool. Although it was Valentine’s Night the hotel had catered for the Bike event participants and had catered an all you can eat pasta buffet. It was fine – just what my husband needed, possibly not my idea of a Valentine’s date! Registration for the event was easy, he registered on the day as we wanted to make sure we and the bike made it across the pond safely. The event organisers were very friendly and helpful. The event itself was well organised, it attracted participants of all shapes, sizes, ages, genders and on all types of bikes. There was a 12 hour and a 24 hour event. While hubby cycled, I went to see some of the local sights – including the Lakeshore Bay Mall – not really much there, extremely quiet although the Belk department store did have a Clinque Bonus time on which was the highlight of my visit. Sebring is surrounded by Lakes – it was quite breezy and relatively cool which in one way was good as there were no bugs, however, it did make it a bit too cold and choppy for on the water adventures. Bike Sebring – given a gold star. Sebring – ok, go if you have an event but otherwise I would say there are many nicer places to stay in Florida. Today we used the FastPass+ kiosk by the International Gateway which was a lot quieter than the other kiosks in Epcot. The set up was the same as we experienced at Hollywood Studios – you could choose 1 experience from Group 1 – Illuminations: Reflections of Earth, Maelstrom, Epcot Character Spot, Soarin, Test Track; and 2 experiences from Group 2 – Captain EO, Journey into Imagination with Figment, Living with the Land, Mission: SPACE, Spaceship Earth, The Seas with Nemo & Friends, Turtle Talk with Crush. So again the dilemma here is with Group 1 where Soarin and Test Track are in the same group. Our FastPass + time for Soarin was within a couple of hours though which is better than we have experienced in the past when we have gone first thing in the morning and got a fast pass time slot for the evening. While these FastPass+ tests are taking place all other Fast passes are suspended. There is an app you can download now – My Disney Experience which will give you access to real-time Park information. Wifi is also available in most areas so you don’t have to go crazy on your mobile data allowance!! Today at Disney’s Hollywood Studios we were able to test the FastPass+ system. The idea is simple you use your entrance ticket and then choose from a selection of FastPass+ attractions. 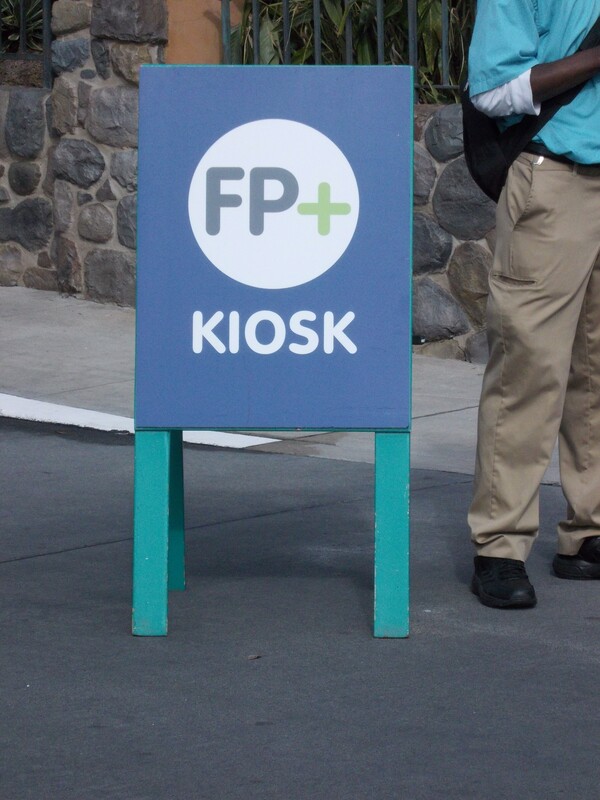 You need to visit a FastPass+ kiosk (see photo to see the sign you are looking for) – in Hollywood Studios they are located at Muppet Vision 3D, Disney’s Hollywood Studios Tip Board and on Sunset Boulevard. Once you have booked your ‘experience’ you go to your ride at the allocated time and just use your ticket to fast pass your way onto the ride. A Disney cast member helped us book our selected 3 FastPass+ experiences. We could book 1 from Group 1 and 2 from Group 2. There is a little twist here as in Group 1 the following experiences are included: Fantasmic, Rock n Roller Coaster, Toy Story Midway Mania and Beauty and the Beast – Live on Stage – this meant we had to choose between Toy Story and Rock n Roller Coaster – we choose Toy Story. In Group 2 you can choose 2 experiences from The Tower of Terror, The Great Movie Ride, American Idol Experience, Indiana Jones Stunt Spectacular, Star Tours, Muppet Vision 3D, Lights, Motors, Action, Disney Junior – Live on Stage and Voyage of the Little Mermaid. We chose Tower of Terror and Star Tours. The reservation system books you the 3 times so it helps you ‘plan’ your day. Our first option brought up all afternoon times, however, this was at 9.30am so we asked for a different option with earlier times and the system obliged! The cast member then gave us the option to take a photo of his screen so we would remember when and where we were due to be. It’s included in your entrance fee.